These mugs are personalized with your family name and skiing or snowboarding figures for each family member. 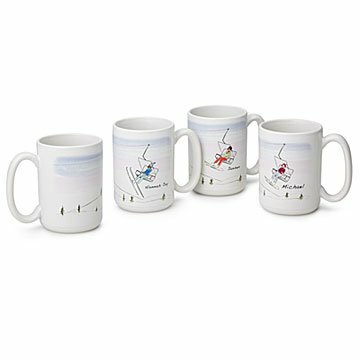 Give your skiing and snowboarding team individual warm-up ware with these personalized family member mugs featuring Patricia Carlin's endearing artwork. The alpine likenesses of individual family members are personalized through your choices of skis or snowboards, skin tone, hair, clothing color, and the mug owner's first name. Create a set to celebrate the individuals connected by your family's winter sport pursuits, whether you're all gathered for cocoa, or toasting in different mountain lodges. Mugs made in Tucson, Arizona, decorated in Rochester, New York. Check out the personalized family print. Top rack dishwasher safe; microwave safe. I have bought these mugs more than once! We enjoy using our mugs and think these make great gifts for families- joint birthdays or hostess gifts. I loved getting to pick out the individual skiiers to add a personalization element but without too much fuss. Perfect gift for parents that have everything! This, they don't have but will love and cherish forever! Awesome as a set. We filled with our favorite skiing candies and gave as a set. Mugs are good quality and will hold a lot of coffee! The artwork on these mugs is even better than I expected. Really gives the feeling of being in the snow. They are a great size for a big cup of cocoa after a cold day on the slopes. This is the perfect gift for any skier. Graphic is lovely, personalized options work for many combinations, mug is large enough for a big cup of hot chocolate or tea or coffee, and it was a hit with everyone I've given it to. Love them!!! Bought 4 of these adorable mugs for my brother in law, sister in law, and 2 neices for Christmas. They all LOVED their mugs. Perfect gift for them to use at their condo in Park City. Adorable & Perfect for the holiday season! Perfect for a morning cup of coffee, especially on a chilly ski day in the mountains! This was a great thank you gift for friends of ours! the mugs were great and our recipients loved them.